Subsequent governments haven’t changed the restrictions on councils – even the Labour governments of Blair and Brown. 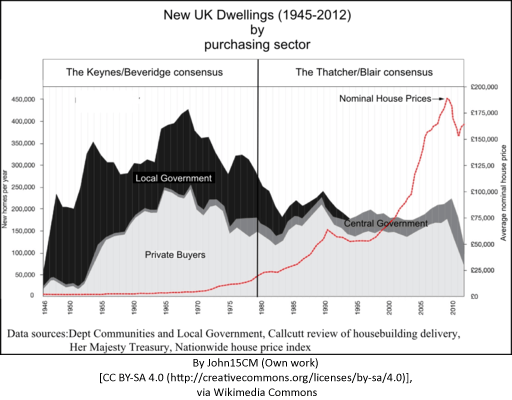 Housing is much more expensive than both the cost of building, and the land it occupies. At agricultural prices, a plot of land large enough for a house and garden costs £500. Once planning permission has been granted, this can inflate to over £100,000. This increase is because planning permission is limited in supply. Many plots with planning permission remain in land banks, until they can be developed at a premium, which leads to inflated house prices. As a result, windfall rewards are reaped by land owners and developers holding the land banks. York Plotlands want very cheap and sustainable starter homes. See £20K housing – a lifestyle revolution. And Plotlands: A shock for the housing market. There is plenty of land to build on surrounding London. See Mapping Population density with Prospex. This shows that the density of the London Region has a bit more than 50 people per hectare but the two adjacent regions have densities less than 5 people per hectare. There’s lots of room if you look for it. Renewal Cities suggested housing 250,000 people on the Hoo Peninsular in the Thames Estuary with a 40 minute train ride to Canary Warfe. And of course, I’m sure you have heard that there is more land in Surrey with golf courses on it than is built up.